Fundus in planitiebus prope Hartney in Manitoba situs. Genera climatis Köppeniana provinciarum planitierum. Terrae gramineae in Saskatchewan meridiano. Triangulum Palliseranum genera soli in provinciis planitierum depingit. Locus communitatum in Alberta, Saskatchewan, et Manitoba, Canadiensibus planitierum provinciis. 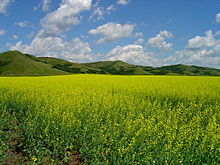 Ager canolae in Valle Qu'Appelle in Saskatchewan meridiano. ↑ "Prairies Ecozone". Government of Canada. ↑ "Wide open spaces, but for how long?". The Royal Canadian Geographical Society. Archer, John H. 1980. Saskatchewan: A History. Barnhart, Gordon L., ed. 2004. Saskatchewan Premiers of the Twentieth Century. Bennett, John W., et Seena B. Kohl. 1995. Settling the Canadian-American West, 1890–1915: Pioneer Adaptation and Community Building. An Anthropological History. Editio interretialis. Danysk, Cecilia. 1995. Hired Hands: Labour and the Development of Prairie Agriculture, 1880–1930. Emery, George. 2001. The Methodist Church on the Prairies, 1896–1914. McGill-Queen's University Press. The Encyclopedia of Saskatchewan: A Living Legacy. University of Regina Canadian Plains Research Center. Fairbanks, C., et S. B. Sundberg. 1983. Farm Women on the Prairie Frontier. Friesen, Gerald. 1987. The Canadian prairies: a history. University of Toronto Press. ISBN 0-8020-6648-8. Google Books. Hodgson, Heather, ed. 2004. Saskatchewan Writers: Lives Past and Present. Reginae: Canadian Plains Research Center. Jones, David C. 1987. Empire of Dust: Settling and Abandoning the Prairie Dry Belt. Keahey, Deborah. 1998. Making It Home: Place in Canadian Prairie Literature. Langford, N. 1995. Childbirth on the Canadian Prairies 1880-1930. Journal of Historical Sociology 8(3):278–302. Laycock, David. 1990. Populism and Democratic Thought in the Canadian Prairies, 1910 to 1945. Melnyk, George. 1998. The Literary History of Alberta, Vol. 1: From Writing-on-Stone to World War Two. University of Alberta Press. Morton, Arthur S., et Chester Martin. 1938. History of prairie settlement. Morton, W. L. 1957. Manitoba, a History. University of Toronto Press. Editio interretialis. Norrie, K. H. 1975. The Rate of Settlement of the Canadian Prairies, 1870–1911. Journal of Economic History 35(2):410–427. JSTOR. Palmer, Howard. 1977. The Settlement of the West. Editio interretialis. Pitsula, James M. 2005. Disparate Duo. Beaver 85(4):14–24. Rollings-Magnusson, Sandra. 2000. Canada's Most Wanted: Pioneer Women on the Western Prairies. Canadian Review of Sociology and Anthropology 37(2):223–238. ISSN 0008-4948. Swyripa, Frances. 2010. Storied Landscapes: Ethno-Religious Identity and the Canadian Prairies. University of Manitoba Press. ISBN 978-0-88755-720-0. Thompson, John Herd. 1998. Forging the Prairie West. Waiser, Bill, et John Perret. 2005. Saskatchewan: A New History. Wardhaugh, Robert A. 2000. Mackenzie King and the Prairie West. Ingles, Ernie B. 2009. Peel's Bibliography of the Canadian Prairies to 1953. University of Toronto Press. ISBN 0-8020-4825-0. Google Books. Wardhaugh, Robert A., ed. 2001. Toward Defining the Prairies: Region, Culture, and History. Wardhaugh, Robert, et Alison Calder. 2005. History, literature, and the writing of the Canadian Prairies. University of Manitoba Press. ISBN 0-88755-682-5. Google Books. Vicimedia Communia plura habent quae ad campos Canadienses spectant. Novissima mutatio die 11 Februarii 2018 hora 16:35 facta.